Rebecca recalls the fresh-faced Pam Ewing of 1978. There’s been a lot of speculation about the identity of Rebecca’s parents on TNT’s new version of Dallas and it seems the mystery will come to a full boil in the August 8 season finale. The July 16-29 issue of TV Guide teases the mystery in a preview of the July 25 episode in which Rebecca and Tommy have a fateful confrontation that reveals the “true nature of their relationship.” Could it be that they’re not siblings after all? If that’s true, fans still want to know if she’s related to the Barnes clan in some way and if she was named in honor of Cliff and Pam’s late mother Rebecca Wentworth. I know this is the central mystery driving fans crazy since Day 1 because my previous posts analyzing possible scenarios for the Rebecca plot have been the most popular ones on this blog by far. A lot of the guessing game is driven by fans’ desires to see classic Dallas stars return to their popular roles. Initially it seemed obvious that Rebecca was Cliff’s daughter with Afton Cooper, whose portrayer Audrey Landers is the subject of a Facebook petition to get her back on the show. When Cliff appeared on the show to reach out to Christopher, however, he didn’t recognize Rebecca much less bring up the coincidence of her sharing his mother’s name. Although Rebecca’s name could just be a coincidence in the plot, a more sinister connection occurred to me when I noticed the similarities between the email that broke up Christopher and Elena and the letter Cliff’s evil half-sister Katherine Wentworth wrote to destroy Bobby’s marriage to Pam back in the ’80s. If Katherine had managed to fool some man in Europe to father a child (or two) with her, odds are she would also name it Rebecca if it were a girl. The Dallas Divas Derby blog put a far more delicious twist on my theory by positing that Katherine fled to Europe already pregnant from her interludes with J.R. while she was trying to snag Bobby! We know that tech-savvy Tommy sent the email and made it look like it came from Christopher’s computer, but that doesn’t mean Mommy Dearest Katherine didn’t put him up to it. As farfetched as it seems, Dallas producers have pulled Katherine out of the woodwork a time or two before, so anything is possible. TV Guide also suggests Pam could be Rebecca’s mother, a theory that ties into the fervent desire of longtime fans to see Patrick Duffy reunited with Victoria Principal. I have to admit I’ve noticed that Julie Gonzalo reminds me of the young Victoria in some of her scenes with Jesse Metcalfe that evoke the early days of Pam and Bobby. With her brown hair and heart-shaped face, I see a plausible connection there. It would be a major coup for executive producer Cynthia Cidre to bring Victoria back to the fold after so many years given Victoria’s steadfast refusal to appear in Dallas after leaving the show in 1987, aside from CBS’s 2004 reunion show Return to Southfork. My mouth salivates at the mere possibility of seeing Bobby and Pam together again, even if not as a couple. We fans must respect the fact that Brenda Strong’s Ann has been a loving wife to Bobby for seven years in the storyline and even if Pam were to show up miraculously, Ann wouldn’t just roll over and let her pick up where she left off as Bobby’s wife. Feisty Ann would probably grab for her trusty shotgun! That said, Pam is no pushover either and this twist could set up a wonderful rivalry that would pit Brenda against Victoria a la Linda Evans and Joan Collins on Dynasty. The possibilities are endless. However, this theory is probably the least likely given that Pam supposedly died after her final scene with Cliff in 1988, played not by Victoria but Margaret Michaels, a daytime soap actress with a passing resemblance to her. Will Dallas producers turn to Margaret Michaels to take over as Pam again? Michaels portrayed Pam in a dimly lit scene in which Pam tells Cliff she’s fallen in love with the doctor who helped her recover from her fiery car accident. Check it out on YouTube. Pam let Cliff think she no longer wanted to be with her family rather than tell him she had only months to live. The catch is that we never got to see Pam die so although it was a less than satisfying wrap-up of the classic Bobby and Pam love story, it opens up the possibility that Pamela Barnes Ewing is alive and well somewhere. Whether she’ll be played by Victoria is another issue. In a fun audio interview on the Dallas Fanzine Website, a candid and playful Victoria reaffirmed her affection for the show and didn’t totally nix the possibility of making a return appearance. Another option is for producers to tap Margaret Michaels again to resurrect Pam. Michaels did a fine job playing a Pam lookalike, Jean O’ Brien, in a brief storyline in 1990 set up to test Bobby’s relationship with his ill-fated second wife, April Stevens (Sheree J. Wilson), so I think they should consider recasting the role if that’s what it would take to get Pam back on the Southfork scene. The return of Pam Ewing would be blockbuster any way you look at it, but would it torpedo a possible reconciliation between Rebecca and Christopher? UPDATE January 2013: As a courtesy to British fans of Dallas, who saw last summer’s episodes after they had run in the United States, I did not reveal in this post that Rebecca was revealed in the season finale to be Pam’s niece Pamela Rebecca. 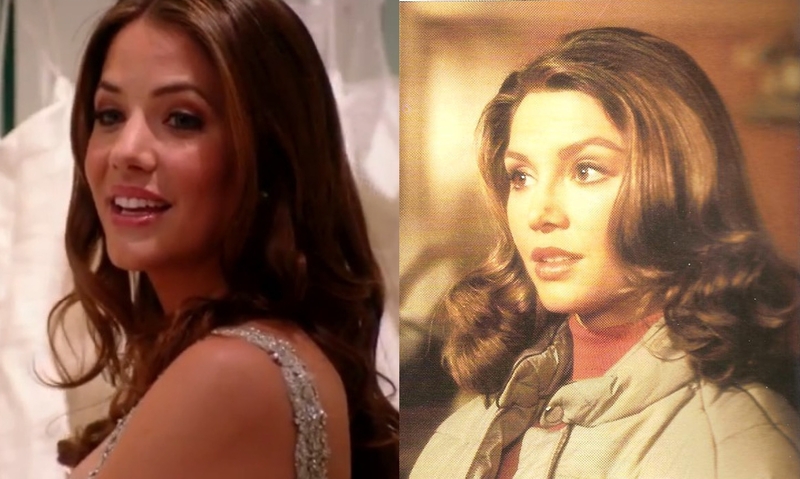 This explains why producers cast Julie Gonzalo, who bears a slight resemblance to Victoria Principal, in the role. Although fans continue to clamor for her return, Victoria’s possible involvement with the new version of Dallas remains up in the air. UPDATE April 2013: The April 15 season finale revealed that the character of Pam Ewing died of pancreatic cancer, unfortunately. Through this twist, the producers of the new Dallas appear to confirm their commitment to keeping the show planted in the present and a recasting of the role seems highly unlikely. My guess is that they’re not interested in reviving Katherine Wentworth either.